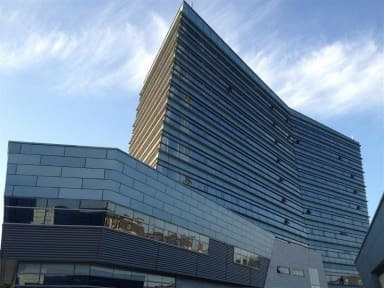 Shanshui Trends Hotel (Huairou Branch) is located in Beijing Huairou New Economic Development Zone, beside the Yanxi Lake. It’s in the south of APEC 2014’s main building —— Sunrise Kempinski Hotel, 71 km from the city center, less than 1 hour’s drive. Huairou has beautiful mountains, rivers and picturesque views. Here, You can visit Mutianyu Great Wall, hear the sutras from Hongluo Temple and taste the Rainbow trout from Huairou Reservoir. It also has Lijiang’s style old towns and bar street. Cultural landscape and natural scenery complement each other. The unique beauty is a gift of nature. APEC 2014, 2015 IHA World Congress, G20 Summit 2016 will all hold in Huairou. With modern and complete supporting facilities and the picturesque views, Huairou, as a new international city centered on Yanxi Lake Ecological Demonstration Zone, has become the first choice of large Chinese and international conference sites, and it will still be a hot spot for conferences and leisure activities in future. All guestrooms in the hotel are equipped with 42 inch widescreen LCD TV, digital TV channels and Wi-Fi. All your needs for business and entertainment will be met. Super mattress, golden self-adjustable pillow and close fitting, soft and comfortable bed linen and towel offer you more care. At the same time, the hotel introduces full touch screen switch technology to give the guests an extraordinary experience. Our facilities include 5 multi-functional conference rooms. Each conference room is equipped with modern conference facilities, such as the audio system. It’s the best place to hold large work conference, seminar, high-end forum, banquet, buffet and cocktail party. The hotel has a western restaurant which can accommodate nearly 200 people. The main food is western food and Cantonese food. Besides midnight meal, the restaurant has breakfast, lunch and dinner buffet. You can enjoy business meals and continental dishes in all kinds of flavors. The hotel is equipped with complete supporting facilities, such as gym, chess room and table tennis room. 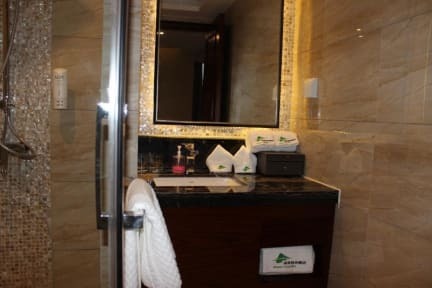 The best thing is the hotel is located in Wanfang business zone which has KTV, cinema, supermarket and restaurant. The guests will feel like living in an entertainment center.